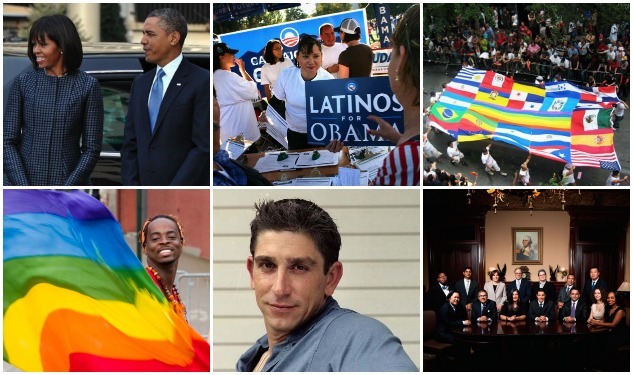 President Obama made history twice as he was sworn into his second term earlier this week, becoming the first president to mention gay rights in an inaugural address, and the first to choose a gay Cuban-American, Richard Blanco, to read a poem. Despite being Latino, I related more to “One Today” than any poem from Blanco’s book about his Cuban heritage, City of a Hundred Fires. I was more thrilled the President chose a gay poet than a Latino one. I’ve always felt like a cultural anomaly, but it wasn’t until a Cornell University professor told me I wasn’t Latino enough that I took it to heart. It was at a creative writing seminar the first day of my senior year. During the previous semester, I completed the second draft of a novel I’d been working on. After class, I approached the professor (a middle-aged female WASP from Ohio and a well-published author) to ask what she thought of my fiction—a young adult fantasy with elements of horror. I felt like I’d just confessed to murder. I was ready for the same lecture I received from other English professors, who already disapproved of my penchant for allegedly “unliterary” genre fiction. Once I told her my make and model was Puerto Rican, the conversation went from awkward to horrifying as she explained how a Puerto Rican should write. Words like “first generation,” and “Latino experience” were hurled at me like napalm. She suggested I emulate Junot Díaz, Ernesto Quiñones, and Gabriel García Márquez. She said to explore what I know. By the time I left, I was confused about what I did know. I charted my Latino experience: I was gay, and the only child of a single mother from the Bronx. I didn’t speak any Spanish, and I went through a terribly awkward teenage Goth phase. Fishnet shirts and eyeliner behind me, I still preferred punk rock to Salsa, Anne Rice to the writers I was told should inspire me. Though born in Manhattan, I lived in rural Maryland from age 3 to 13, where I quickly learned to forget my ethnicity. Race was the word used in Maryland, and being any race that was obviously a race was unpopular. I was one of four Latinos in my middle school, and got pushed in the playground after 9/11 because I was confused for Middle Eastern. At sleepovers, friends asked why my mother didn’t have “a dot on her forehead.” When I tried explaining I was Puerto Rican, I was met with puzzled expressions. Later, it occurred to me they probably didn’t know what that meant. My mother never taught me Spanish. She wanted me to have the most "normal" American childhood I could expect as a minority in a town that harbored no overt malcontent but simply didn’t understand us. Even now that I’m living in the Bronx, surrounded by extended family, I’m not completely understood. My uncles playfully refuse to pass the platanos (fried plantains) at dinner because they’re for “real” Puerto Ricans, and my aunts love asking me to dance so they can correct my rhythm. I don’t have a “crew” of Puerto Rican friends to hang out with in the neighborhood—I feel most at home in Queens with my best friend, a Jewish girl with diabetes, and our “grab bag” of mixed ethnicity acquaintances. This was my Latino world; not the one my professor was trying to elicit. If anything, mine was the experience of somebody intentionally avoiding ghettoizing my creativity. Had she known I was gay, she would’ve told me to write about being gay. My feelings toward her thawed after I acknowledged this was a halfhearted attempt at encouraging me to embrace a legacy of great writers to which I was bound by heritage and hardship. She wanted me to explore what I knew—she just incorrectly assumed I knew what Junot Díaz knows. I dropped her class for a professor who favored stories about men rubbing cats on their face and poems about landfills, but I still learned more that day than I did the entire semester. By figuring out who I’m not, I discovered who I am: eclectic, unusual, a Latino who pretends to be white—or a white boy with a year-round tan, depending which of my friends you ask. Once I overcame the embarrassment of not knowing what the Latino experience was I understood that I might never belong wholeheartedly to any group that might have me. But that’s OK. There are things I can’t do well: driving, cooking, sports—I confuse the Super Bowl with the World Series, and I’ve been known to burn pasta. But being Puerto Rican isn’t something you can do. Instead of giving voice to Latino culture, Richard Blanco read a poem about America that showed that even his experience—as a gay man, a poet, a Cuban living in Maine (of all places)—is not universal. In a nation like ours, there’s no one way a minority culture grows up. Even President Obama’s experience is different than other African Americans’ because of his mixed ethnicity.